Giannis Antetokounmpo’s tip-in with 5.1 seconds left, gave the Milwaukee Bucks a 104-102 win over the Celtics on Sunday afternoon at the BMO Harris Bradley Center. The victory means the Bucks will play at least one more game at the Bradley Center with game six on Thursday night. Game five is Tuesday night in Boston. 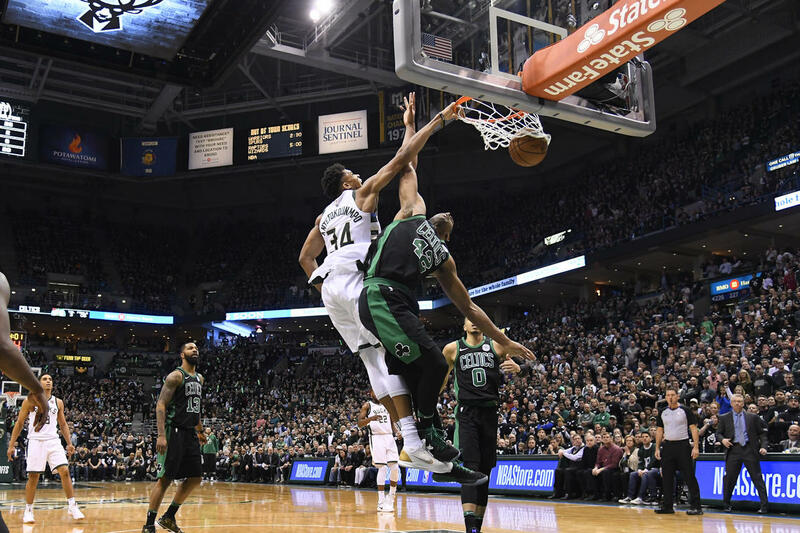 The Celtics had a chance to tie or win it, but Marcus Morris shot was just off the mark as time expired, giving the Bucks their second straight win in the series. Antetokounmpo led the Bucks with 27 points on 12-of-20 shooting. Khris Middleton added 23 and Jabari Parker came off the bench to score 16 points. The Bucks led 51-35 at halftime and saw that advantage climb to 20 points (65-45) in the third quarter, but the Celtics came storming all the way back. Jaylen Brown scored 19 of his 34 points in the second half. The Celtics tied the game at 77 with more than nine minutes to play and it was back and forth the rest of the way. Malcolm Brogdon finished with 10 points on 4-of-7 shooting. His biggest basket was a corner three in the final minute to give the Bucks a lead. To win the series, the Bucks will need to win one game in Boston. Their first chance comes Tuesday night at TD Garden. After turning it over 20 times in the series opening loss in overtime, the Milwaukee Bucks coughed it up 15 more times on Tuesday night, falling to the Boston Celtics 120-106 at TD Garden. They’ll return to Milwaukee for games 3 and 4, trailing 2-0 in the best-of-seven opening round series. Giannis Antetokounmpo (30 pts) and Khris Middleton (25 pts) combined for 55 points on 23 of 31 shooting from the field. The rest of the team struggled to find any consistency at either end of the floor. The Bucks shot 59.7% from the field and 41.2% from three-point distance, yet still lost by 14 points. They struggled to defend and they struggled to rebound. Those two areas, along with the turnovers were deciding factors in the outcome.